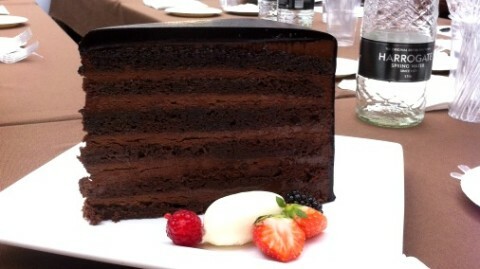 The Chocolate Show, The International Chocolate Awards & The Chocolate Dessert of the Year! An update on the busiest weeks of my chocolate year! 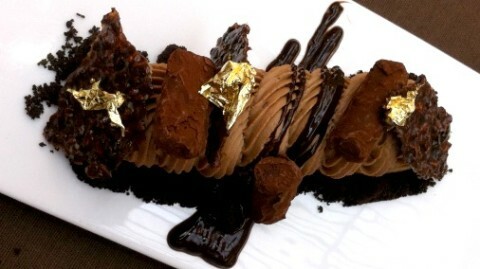 Boy oh boy, the last few weeks have been full of chocolate happenings! 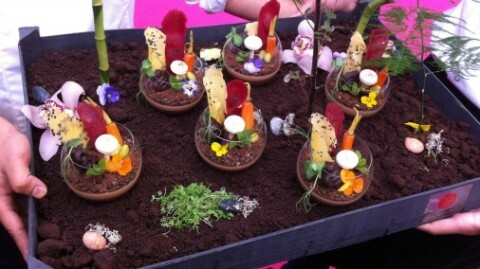 And it all came to a head during Chocolate Week and The Chocolate Show at Olympia (14th-16th October). Please forgive my delay in writing it all up for you, I’ve had a technical glitch on the blog, but all fine now, fingers crossed. 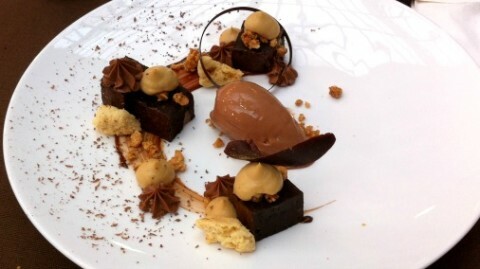 Chocolate Week always sees delicious happenings up and down the country. And The Chocolate Show, now in its 4th year, is the most glorious get together of the chocolate great and the good. For me the run up to this event is as saturated with chocolate as can be. The judging of the world finals of The International Chocolate Awards was a seven day bonanza of intense chocolate tasting, assessing and medal deliberation. This year, for the first time and thanks to Barry Johnson (fellow judge and tutor there), our judging HQ was in The National Bakery School. As each day went by, through selection rounds, main rounds and Grand Jury judging, the arrival at Waterloo East was increasingly filled with wonder at the sheer volume of stunning chocolates we have been able to consider this year. 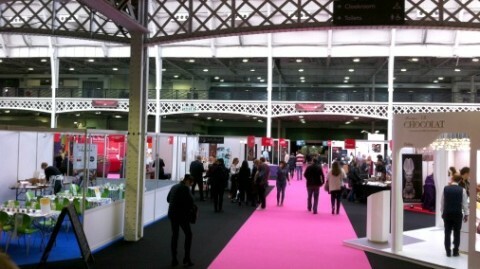 The Chocolate Show takes over the grand hall at Olympia. With one chocolate free day in between (optional of course) we were straight into The Chocolate Show, which opened with its must-attend gala complete with chocolate fashion show (see photo above). There were two highlights of the show this year for me. Firstly, I had the honour of judging the inaugural Chocolate Dessert of the Year Competition (more on that in a moment). Secondly The Chocolate Show hosted the world final awards ceremony of The International Chocolate Awards, which was a very special evening indeed (again more on that in a mo). 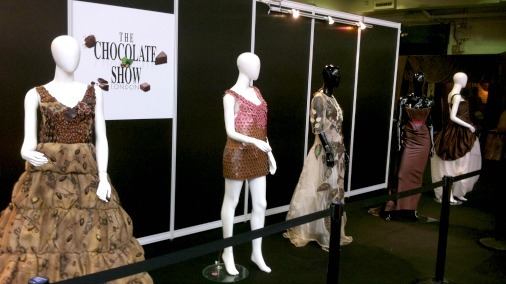 Firstly, in case you missed it, and in order to ensure you have it in bold in next year’s diary, a little about The Chocolate Show!. 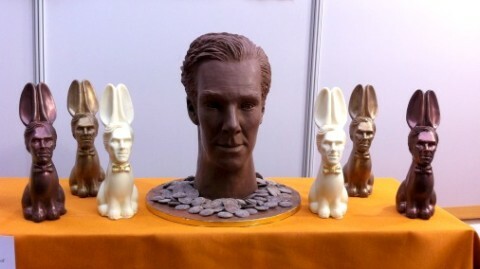 Chocolate Benedict and his Cumberbunnies. There were so many sights to see! Including chocolate ‘Cumberbunnies’. Yes, they really are a thing. Santiago Peralta of Pacari on his stand. 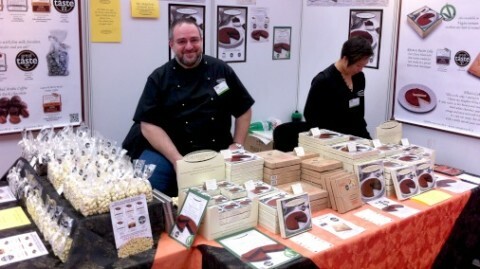 The Chocolate Show is crucially never short of real heavyweight world class chocolate. 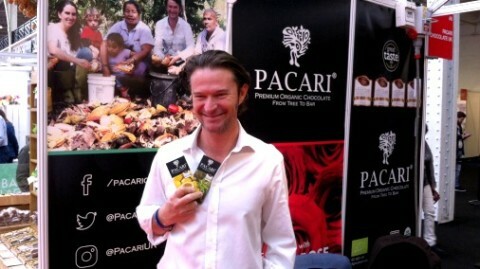 Here is Santiago, founder of Pacari from Ecuador, a couple of hours before receiving yet more world awards. 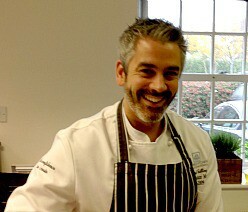 Claudio Pistocchi of Torta Pistocchi. I always embrace this rare chance to pick up glorious Italian award winning treats from Torta Pistocchi and chat to their creator Claudio Pistocchi. 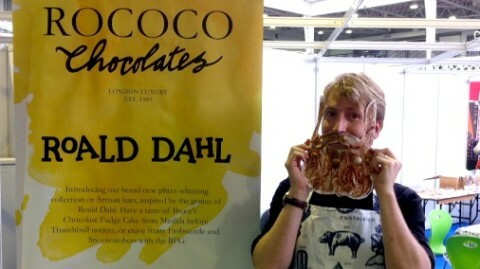 Sam Smallman of Rococo with a chocolate beard, part of their Roald Dahl celebrations. The usual wonderful fine chocolate offering from Rococo was augmented by their new Roald Dahl collaboration. Here Rococo’s Sam Smallman shows off a brilliantly bonkers chocolate beard from one of the great children’s workshop he was running. 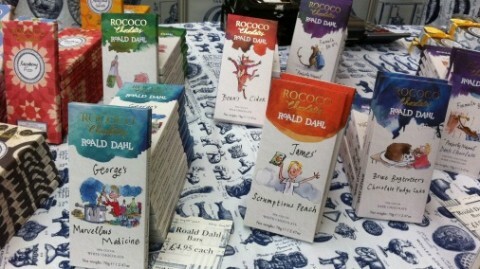 Deliciously fantastic Roald Dahl inspired bars from Rococo. And here are a the Roald Dahl bars! Snodcumber anyone? The beautifully covetable advent calendar from Paul A Young. Essential to the roll call of truly great chocolatiers is of course Paul A Young. 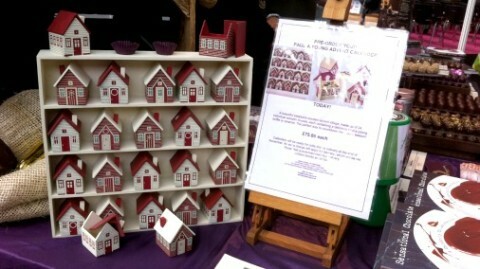 Paul’s stall featured two particularly special things to buy. His advent calendar of little wooden houses which arrive for advent filled with his delicious creations, is simply beautiful and of course can be refilled again next year. I so want one! The other new treat I already have! Paul’s new book, Sensational Chocolate, is a must-have collaboration with an ultra starry list of fellow chefs and friends, who have all contributed recipes. All profits from this utterly tempting tome are in aid of The Children’s Air Ambulance; an essential contribution to this most worthwhile cause. Peter Svenningsen and Mikkel’s 1 & 2, the Danish dream team. Here are three chocolate wonders showing the love! 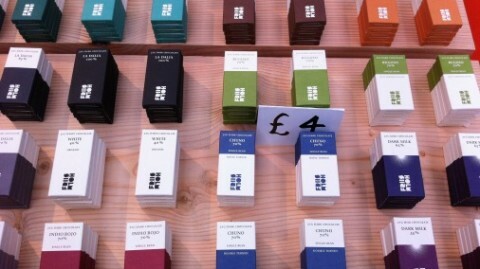 Mikkel Friis Holm’s superb chocolate is known to all my readers. 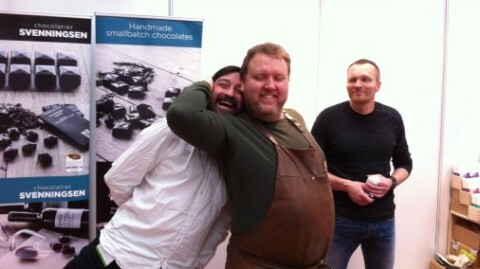 His studio mate Peter Svenningsen makes such good chocolates using his chocolate that Mikkel reckons he deserves a hug. Looking on is Mikkel Juul Jensen, Mikkel no. 2 is Mikkel no. 1’s childhood friend and partner in chocolate creation. New mini-bars from Friis Holm. 2016 was a special year for Friis Holm chocolates, in which all the chocolates were made bean to bar by Mikkels 1 and 2. 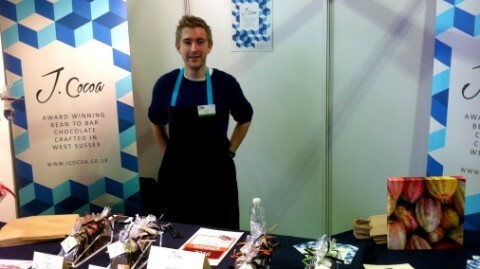 Previously Mikkel has worked with French brand Bonnat to realise his chocolates. But the dream to create bean to bar has been long held. The new factory is in full swing, all the chocolates are now fully realised in house, and the results are spectacular. Friis Holm are now hitting amazing heights, again winning many awards, not only in their regional heats but also on the world stage. New release! Friis Holm white chocolate. 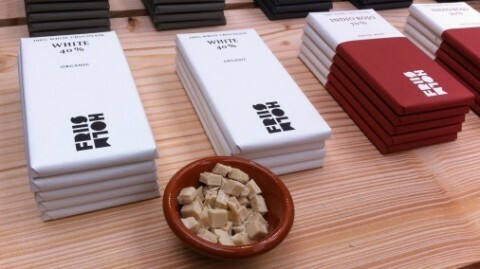 And Friis Holm have thrown down the gauntlet by creating a white chocolate for the first time. Could this be the best white chocolate in the world? It was too late into production to compete this year, but in my humble opinion I have never tasted a better one. 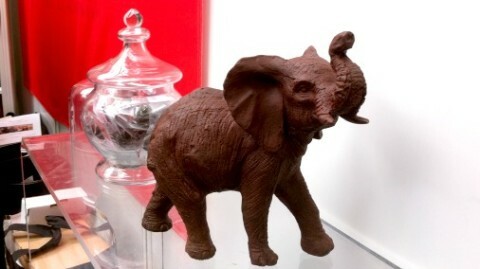 Chocolate elephant from newcomer R Chocolate. Of course there were also plenty of newcomers. 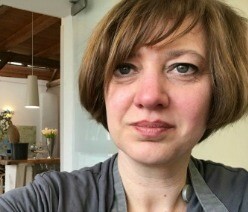 R Chocolate is a new chocolatier working with Original Beans chocolate. They have an outlet in Richmond and are opening in early November in Pimlico. I will be discovering more to tell you about their work in future, but in the meantime I loved this elephant! New kid on the block, J. Cocoa. New bean to bar chocolate maker J. Cocoa are creating their chocolates in West Sussex. 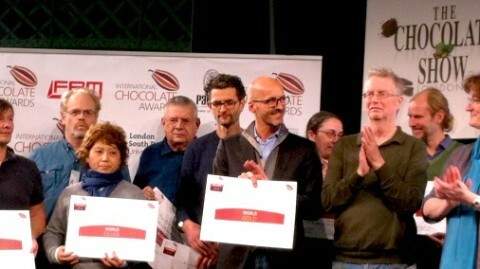 They have already managed to garner some awards in the International Chocolate Awards European chocolate makers heat. Watch this space, look out for their chocolate, and I will investigate for you too. A batch of award winners with Peter Svenningsen and Claudio Pistocchi. 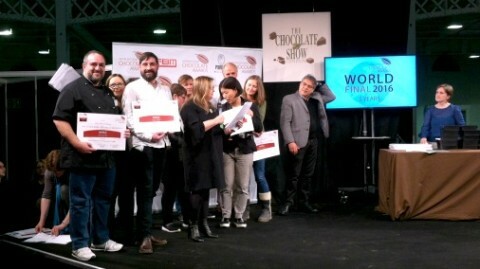 And so to the culmination of the 5th year of The International Chocolate Awards, our world finals ceremony! It was a very special night, with chocolatiers and chocolate makers flying in from far flung locations, from Japan to the Americas and everywhere in between, to receive their awards. Some of those that couldn’t attend sent videos, which added up to a ceremony that was a wonderful testament to the place the awards has in the hearts and minds of chocolate people. Here a stage full of winners, including multi award winner Guido Castagna over from Italy and Chris Brennan of Pump Street Bakery. The International Awards founders look on as Stephane Bonnat celebrates his win. 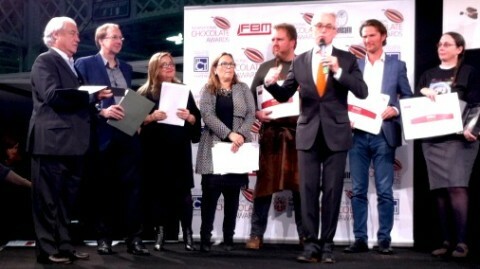 Here Francois Jeantet, founder of the Salon du Chocolat, Martin Christy, Maricel Presilla and Monica Meschini, the founders of The International Chocolate Awards, Grand Jury member George Gensler, plus serial award winners Mikkel and Santiago, listen to Stephane Bonnat’s wonderful speech. Bonnat won the award for best dark chocolate bar overall, the daddy of the awards, and charmed us all with his humour and humility. Some of my fellow judges, smiling in anticipation of chocolate dessert! 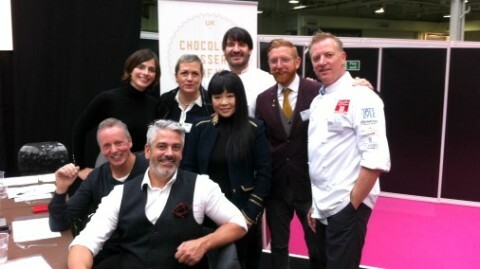 My other big event of the show was being up on stage with this motley crew to judge The Chocolate Dessert of the Year competition. What a star cast, including Mark Tilling (UK chocolate master and GBBO Creme de la Creme winner), Cherish Finden (Executive pastry chef of The Langham and GBBO Creme de la Creme judge), Paul A Young, Eric Lanlard (TV chef and chef/patron Cake Boy), Martin Chiffers (head of the UK pastry team), Keith Hurdman of Felchlin, Stephanie Perrot of Valrhona, Chantal Coady of Rococo, Xanthe Clay (food writer), Sara Jayne Stanes (Chair of the Academy of Chocolate), Rebecca Woollard (food editor Delicious magazine) and Frankie McCoy of The Evening Standard. It was an amazing privilege and tremendous fun taking part in this inaugural year of what is set to be a fabulous annual event. We oohed, we aahed, we argued, and we picked a worthy winner. Here below are snaps of the finalists, all prepared on site for our delectation. It’s a tough job….. I liked this, and not only due to its tremendous size. As Paul put it, this was like a hug, a very comforting set of flavours and textures, easy to love. Nutella, waffle, coffee and milk. Tremendous textures and techniques here, hence it winning 3rd prize. 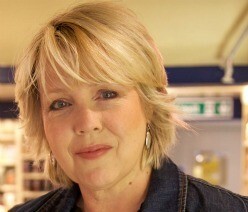 Well done Laura Petersen of The Salt Room. 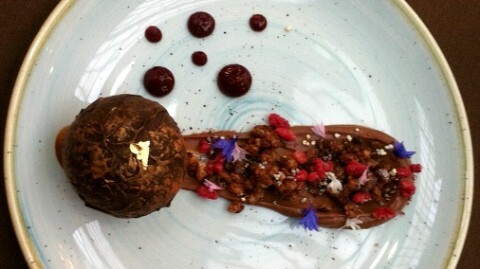 Choco-cherry, Peruvian alto chocolate ball with pisco cherry. A great partnership of chocolate and cherry, here brought up to date with an exciting chilled mousse inside a technically stunning fine chocolate shell. The brownie was mild in flavour, the sorbet excellent and the presentation was stunning. In second place! This take on an eclair from Louise Rigden of The Royal Opera House was a great hit, everyone around me loved it, as did I! Combining fine chocolate truffles, a very well judged coffee cream and a chocolate filling with added feuillentine texture, it was great fun and delicious. A bit of a marmite choice this, the avocado was stunning to look at, and intriguing. 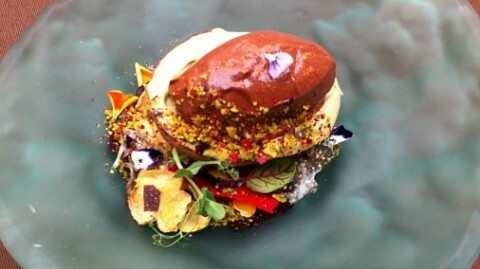 A fine avocado ‘shell’ was created of chocolate and filled with avocado mousse, paired with a dark chocolate mousse. 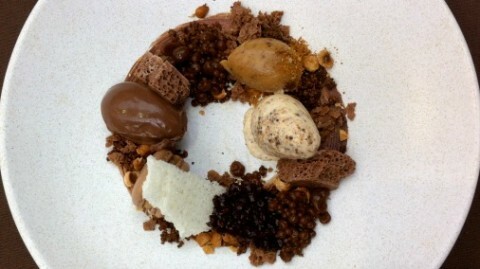 An unusual set of flavours and textures that got us all talking and tasting. A nice bit of boundary pushing. How beautiful is this! Each pot contained a nostalgia-inducing chocolate pudding, with party-in-the-mouth popping candy. Beautiful and fun. And the winner is! David Simak, pastry chef for Albert & Michel Roux at their new venue Crossbasket Castle, blew us all away with this autumnal vision. Above is half the plate, which contained two such clusters. Milk chocolate ‘cobnuts’ were filled with either yuzu or hazelnut parfait, alongside a malty tender sponge, sharp berries and crisp shards of hazelnut. A deserving winner. Last but not least we had this technical white chocolate plate. 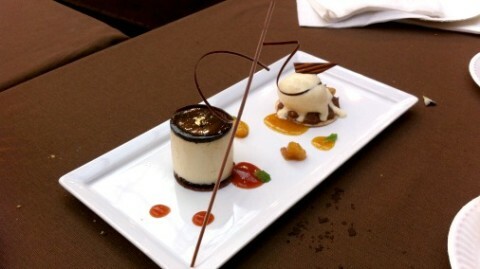 With sharp and spicy fruit for contrast, it completed a stunning and delicious parade of desserts.